4" x 9" 5" x 7" 5.5" x 8.5" 8.5" x 11" 11" x 14" 11" x 17"
Each table tent is meant for use with 4"x6" menu cards or other signage. 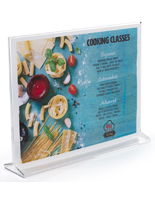 This acrylic holder is versatile and can be used in most any type of setting. This print frame is 4" wide x 6" high and made of acrylic. 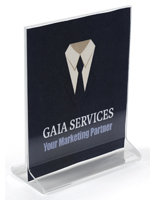 This table tent, cheap acrylic frame features an open top design that allows for easy sign changes. 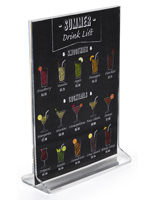 To update the display, simply slide the old menu card out through the side and replace with a new image or advertisement. 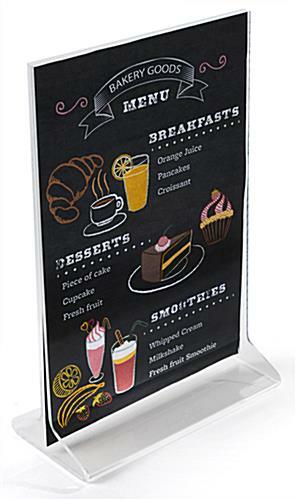 Use this table tent as a double-sided sign holder by inserting two prints back-to-back. 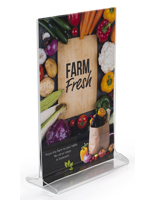 The clear acrylic framing provides protection for the advertisements on display, as well as an unobstructed view. This table tent is easy to maintain with an occasional damp cloth. Acrylic should not be cleaned with ammonia-based products as it will cause damage. 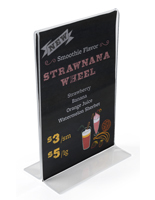 This table tent that holds 4"x6" signage is perfect for displaying menu and drink specials. 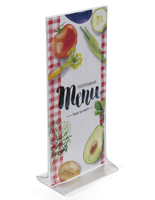 Place this acrylic sign holder on a bar or restaurant tabletop to create an effective means of promoting food and beverage items. 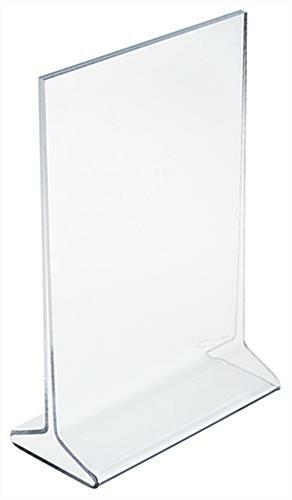 This table tent that is used on a tabletop is also used in hotel rooms to display the TV channel listings. The popular 4"x6" size is also commonly used for photos. This table tent is also offered with silkscreen imprinting for an additional per unit fee. Email the address above for more information. 6.5" x 6.3" x 2.6"
4.0" x 0.5" x 2.6"
I've been purchasing from Displas2go for years. They've always provided quality products and fast shipping. I highly recommend them! Thank you so much for the great review and for your continued patronage! 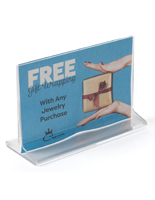 We use these holders to display information for the customer loyalty programs we provide our restaurant clients. They don't take up much table space and with a well-designed insert they fit in nicely with any decor. We do have to swap out the holders about once a year at some fast casual restaurants due to finger prints and food stains, but that is more of a cleanliness issue than a reflection on the holder quality. Thanks so much for the great review! We hope you shop with us again soon. We have a pizza/pasta restaurant. 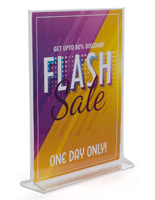 These sign holders work great for table top advertising. I display the food item I want our guests to try with a discount offer. Works great. I place one on every table. These acrylic table top holders are exactly what I needed. They look good and have a very good feel to them.